This post goes with a book review of the exhibition catalogue Visionaries: Creating a Modern Guggenheim (2017) for Museum Bookstore which is posted here and also follows in a slightly different form below. 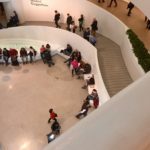 It has been one of life’s great pleasures to see Franz Marc’s Die gelbe Kuh many times over the years at the Solomon R. Guggenheim Museum. Every time I get the same huge surge of joy as the first, and I think other people feel the same way. When the painting is where it lives normally, in the Thannhauser wing, you can sit on a bench in the gallery and watch people come in, weaving their way through some much smaller woodcuts and decorated books, and then turn the corner to be met by this enormous colourful and cheerful painting. Always a lot of oohs and ahhs and delighted small children. 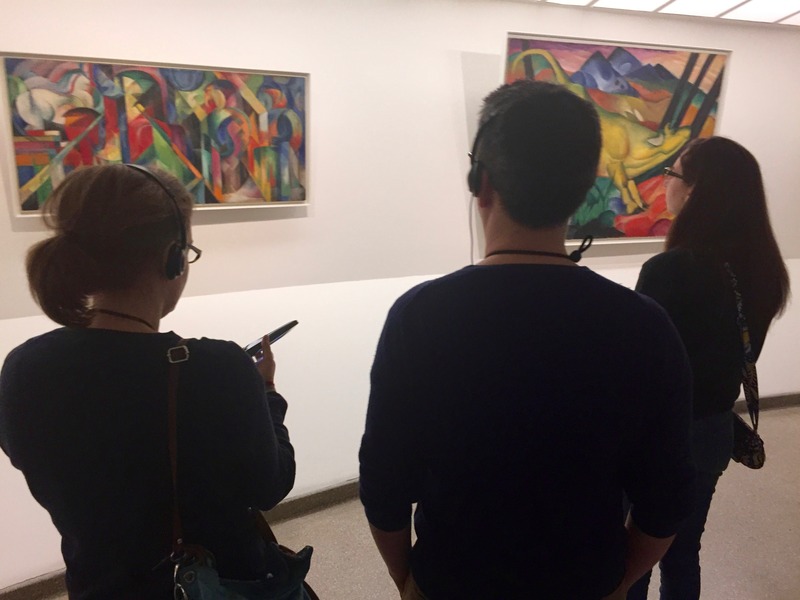 People admiring Franz Marc’s Stallungen (1913, l) and Die gelbe Kuh (1911) at the Guggenheim. Edited and introduced by Megan Fontanella with chapters by Vivien Greene, Jeffrey Weiss, Susan Thompson, Tracey Bashkoff, Lauren Hinkson, and Susan Davidson and published by Guggenheim Museum Publications, this catalogue accompanies the eponymous exhibition held at the Solomon R. Guggenheim Museum in New York City, 10 February-6 September 2017; 312 pages with color reproductions of all the paintings and sculptures from the exhibition plus archival photographs, illustrations, letters, and newspaper and magazine notices. The “modernization” of European art around 1900 is usually associated with the evolution of line, color, and figuration toward abstraction, as manifested by Expressionism and Futurism. The fact that art collectors and dealers played an important role in codifying what we think of now as Modernism is brought to full light in the catalogue Visionaries: Creating a Modern Guggenheim, produced to coincide with the exhibition of the same name. In fact the catalogue seems, at least at first glance, intent upon driving home the idea that art is a business, opening with the normally blank flyleaf emblazoned with corporate logos and an unprecedented “Sponsor Statement” by Francesca Lavazza, heir to the Lavazza coffee brand, the underwriter of the exhibition. However the scholarly contents are innovatively presented and well-researched, with five sections devoted to each of the “visionaries” (in this case being the collectors, not the artists), paired with a focus on one of the museum’s key acquisitions. An opening essay by the Guggenheim’s curator of collections and provenance, Megan Fontanella, introduces the scope of the exhibition and the historical circumstances that allowed American entrepreneur Solomon Robert Guggenheim to decide in the 1920s, after five decades dominating the U.S. mining industry, to become the world’s foremost collector and exhibitor of what became dubbed “non-objective” art. (42) As in the rest of the book, the introduction offers wisely-selected and superbly reproduced works from both the immediate exhibition and from other sources. In fact the catalogue is an outstanding exercise for those willing to read between its restrained lines. Taken this way, an excellent contemporized portrait of the Guggenheim’s co-founder and first director, Hilla Rebay, emerges. Fontanella and Susan Thompson dispense with the “female hysteria” characterization of Rebay as the occult-obsessed lover of painter Rudolf Bauer to focus on her acumen as a businesswoman and strategic positioning as a collage artist. Thompson shows Rebay’s collages – figurative portraits for the most part, more like mosaics made with bits of paper than Hanna Höch’s more associative and confrontational critiques of Weimar culture – as a distinct oeuvre outside the canonical avant-garde’s concentration on sculpture and painting. …Or works that might have been returned to their rightful owners. Other collectors and dealers were both respectable and well-liked by artists while maintaining philanthropic and business dealings with the Guggenheim, including Katherine S. Dreier and Justin Thannhauser, to whom other chapters are devoted. Karl Nierendorf also falls into this category, and is the subject of the catalogue’s friendliest section, “Estate of Karl Nierendorf / Universe Within: Paul Klee’s Horizon, Zenith and Atmosphere” by Lauren Hinkson. Nierendorf, who had known Klee since 1919, addressed Klee’s work in terms of Bergsonian empathy, and fully appreciated the artist’s devotion to the study of the natural world. The catalogue also offers the opportunity to marvel at some masterworks by artists less dominant than Kandinsky and Klee in the Guggenheim’s collection who are often lost in the circus atmosphere of the museum, such as Joseph Cornell’s startling, again-relevant Untitled (Fortune Telling Parrot for Carmen Miranda) (1939) and Merzz. 53. rotes Bonbon (1920), a collage from the life-project of Kurt Schwitters. 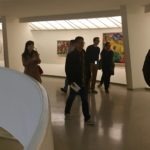 Visionaries marks another occasion in which the catalogue is essential to appreciate or even properly see the exhibition, served poorly by the famous design of the building which is what many tourists come to visit over and against the art it contains. Frank Lloyd Wright could not have anticipated, in 1959, that the museum would become a crowded and noisy social space thwarting his intention for an organic form to house art that sought to collapse the barrier between the visual and real worlds. 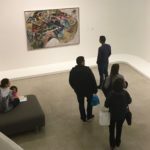 As it stands, the Visionaries show has moved some of the works from the rectangular Thannhauser wing into the main hall, a thoroughfare that is precisely the wrong environment for the Expressionist works that are the cornerstone of the collection. For example, Franz Marc’s Die gelbe Kuh (1911), normally the centerpiece of the Thannhauser, hangs on the third level beside the rarely-exhibited Stallungungen, his last painting of horses, from 1913. Stallungen is a big (74 by 158 cm) painting, but Die gelbe Kuh is huge (140 by 189 cm), and the “smaller” canvas is dwarfed, its more faceted essential content muted by this placement. In the book, Stallungen is restored over two facing pages, making it possible to take note of the fusing of architectural and equine elements.